Hello there and welcome to release day! The new sets from Clearly Besotted will be releasing tonight at 8pm BST. I have one last teaser to share with you before sharing my release video with you in a few hours. 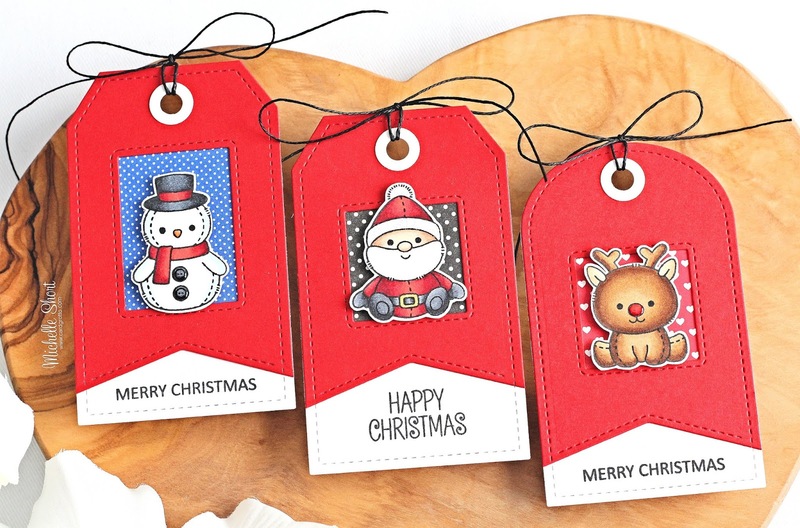 For my final teaser, I am using the wonderful Winter Plushies set to create some fun Christmas tags. 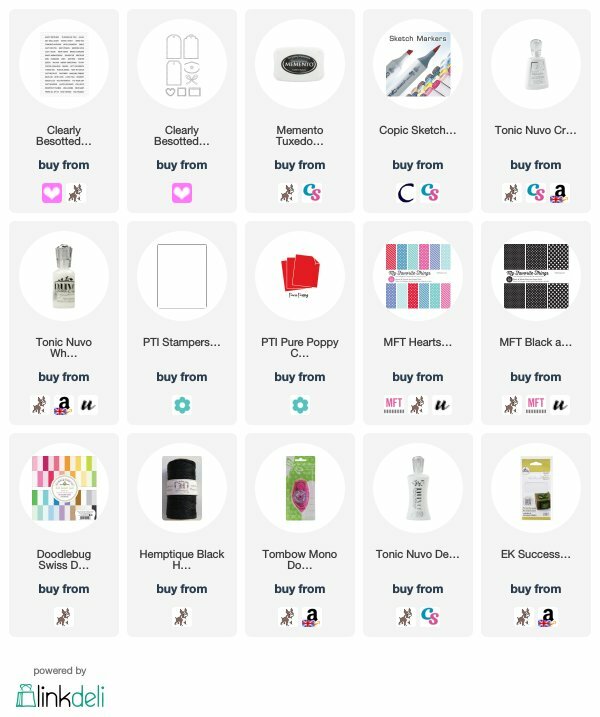 I started off by stamping the snowman, Santa and reindeer from the Winter Plushies set on to white cardstock with Memento Tuxedo Black ink. I coloured them with Copic Markers and fussy cut them out with scissors (but there will be coordinating dies available). I added Crystal Glaze to the snowman's buttons and reindeer's nose and Nuvo White Blizzard drops to Santa's hat and set aside to dry. For the tags, I first die cut three whole tags from white cardstock using the Tag Along Dies. I then cut another three from red cardstock. For these layers I then die cut again using the fishtail banner and also the square and rectangle dies to create windows. These were layered up with tape runner and the hole reinforcer added on too. I stamped the sentiment on the white layers using the Tiny Type set and also the Hippo Christmas set. I used patterned paper for the insides of the windows and then added the critters on top with foam tape. To finish off, I added twine through the top of the tags. COPIC MARKERS: Reindeer - E59, E57, E55, E53, E51, R89, R27, R24. Santa - E13, E11, E00, E000, W1, W0, R89, R37, R27, R24, C10, C7, C5, Y26. Snowman - BG000, BG0000, C10, C7, C5, R89, R37, R27, R24, YR65, YR18. 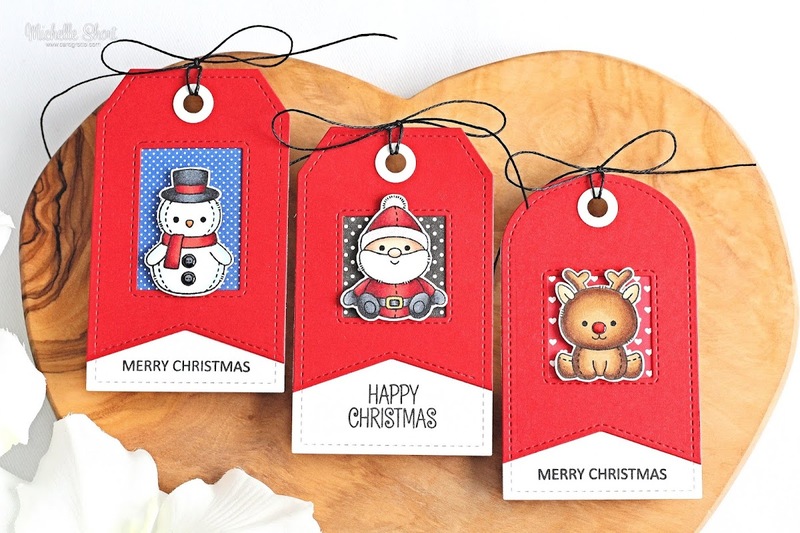 I really like creating tags for Christmas. I think a handmade tag looks really nice on top of a present. Thank you so much for stooping by. Please do head over to see my teamies Stephanie, Keren and Lisa. I know they will have something wonderful to share with you today and please pop back in a couple of hours to see my release video.